Spokesmama: Bronte 1.0: Happy Birthday! She's got six words that we can sort of understand so far: mama, teeth, yeah, hi, up, uh-oh. She waves goodbye & hello consistently now. B still nurses fairly often--about five or six times a day. She's still waking up at some point during the night--generally around 4 or 5am after 7-8 hours sleep--then goes back down for a few more hours. Bronte is super social, always wants to be where the people are, making eye contact with strangers in public, laughing whenever anyone else does, shouting along with her brother, reaching out for people's hands. She made strange for the first & only time so far in mid August. She's been held by new people several times since then & not reacted badly again. She's standing occasionally but not walking on her own yet. Climbing is Bronte's favourite activity, hands down. 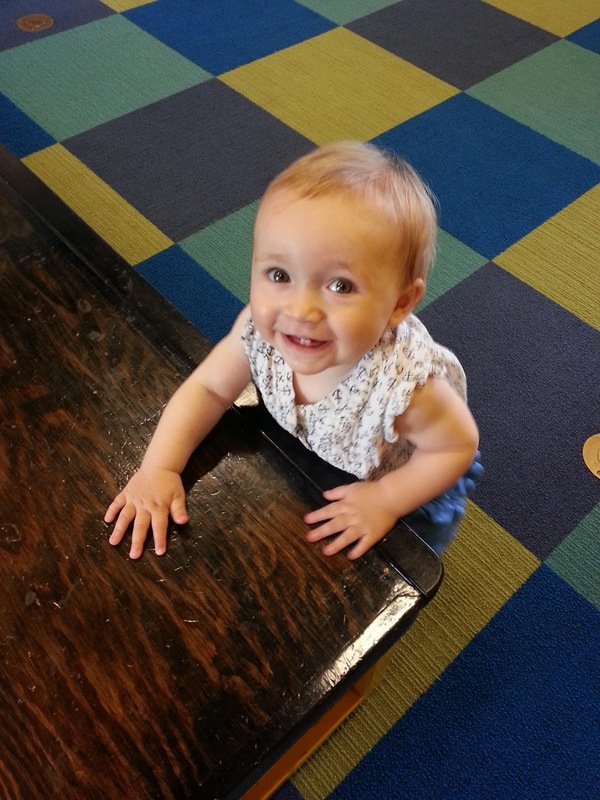 She climbs onto the little kids chairs, then the play table. She climbs onto the ottoman, then the coffee table. She pulls herself onto the couch. She climbed her brother's tripp trapp chair & was about to get onto the kitchen table when I caught her. She's also figured out how to get off our bed now--she backs down & slides off. Baby B now has six teeth. She's still using them on me every day. Ouch. Her favourite things to eat are crunchy foods like papadums, tortilla chips, rice cakes, & goldfish crackers. Also fruit, lots of fruit. She still puts everything in her mouth, but seems a bit less interested in actually eating paper these days. She'll also put out her tongue or spit out what's in her mouth if asked to do so. Bronte's favourite toy is not a toy--she loves putting anything on her head as a hat. She'll do it with any hats she finds, or paper, or boxes, or toys, or facecloths... anything.